What Is The Difference Between A Wristband And A Bracelet? Humans have been wearing various types of accessories around their wrists for centuries. They were a symbol of power in some early communities while others wear them as a fashion accessory. In the modern world, bracelets and wristbands are popular as a wrist-wear. Wristbands are also known as rubber bracelets. However, a wristband and a bracelet are taken as two different accessories. What’s the difference between a bracelet and a wristband? A bracelet falls in the category of ornaments. It can be a chain or a band that individuals wear around their wrist as a jewelry. A bracelet is made of different metals, including gold and silver. It is usually worn on a special occasion or is matched with a dress to complement it. 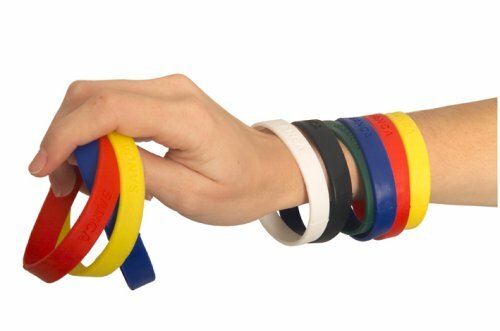 Wristbands, popularly known as silicone bracelets, are colorful cuffs or straps that a wearer can wear around his wrist for different purposes. Rubber wristbands became extremely popular after Lance Armstrong used them for his Livestrong Foundation. One can wear a wristband anytime as they are easy to wear. A Wristband And A Bracelet: What’s The Difference? Wristbands are more affordable than metal bracelets. Wristbands come in many types and colors. Variety in bracelets comes in the form of metal types. You can customize wristbands to use them as a promotional tool. On the other side, bracelets can be customized only as a fashion accessory. A wristband is a casual wrist accessory that you can wear with any type of clothing. On the other side, a bracelet is an accessory to wear on a special occasion. Wristbands are also known as rubber bracelets and silicone bracelets. You can use them as a fashion accessory or a tool of promotion. You can design your own wristbands as per your requirement at Make Your Wristbands.